Las Vegas police released 911 audio and body-camera video Monday after a man with a knife was fatally shot by a sergeant last week. 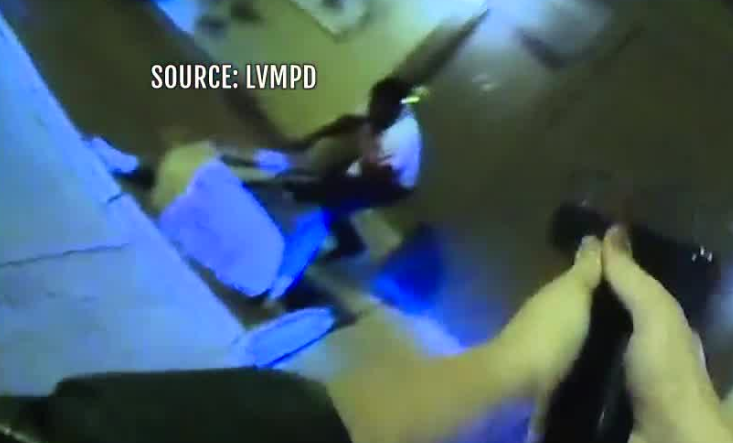 Las Vegas police released 911 audio and body-camera video Monday after a man with a knife was fatally shot by a sergeant last week . Assistant Sheriff Brett Zimmerman called last Wednesday's incident "a chaotic and rapidly evolving event." Investigators say Sgt. Daniella Cino was responding to a call of the man attacking a woman around 9:05 p.m. at an apartment complex near Tropicana Avenue and Boulder Highway. The man was identified by police Monday as William Fuller and said he had no known criminal history. When the officer arrived, investigators say the officer saw the man on top of the woman stabbing her. The man reportedly followed commands to get off of the woman, but police say he charged at the officer. The police sergeant fired two rounds. "Her actions prevented a woman from being killed in a domestic violence incident," Zimmerman said. He then noted the domestic violence resources available in the Las Vegas community. "If you know someone who is a victim of domestic violence, do not stay silent," Zimmerman said. Zimmerman added that the woman is in good condition and was able to be interviewed by officers. The 911 audio released Monday also indicated that there were three children in the apartment. The children were able to get out of the apartment safely. Watch the full police press conference below. WARNING: The audio and video may been graphic for some.